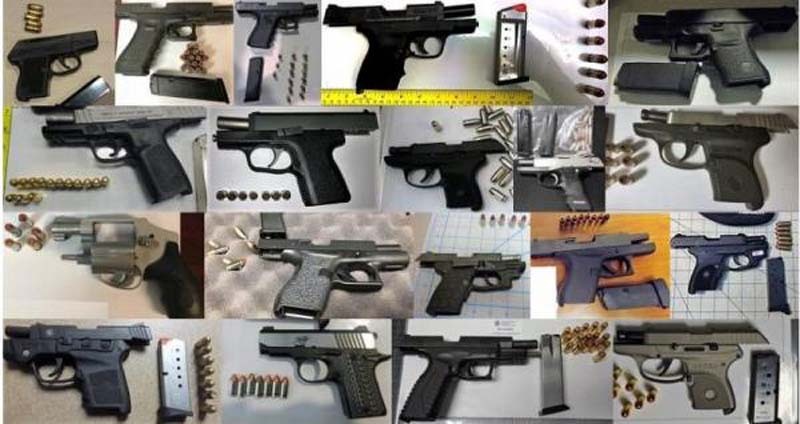 In a single day earlier this month, the Transportation Security Administration seized more than two dozen firearms at 15 U.S. airports, a new record. The record was set during the week of April 30-May 5, when screeners recovered 90 firearms at U.S. airports. Officials sad 73 were loaded and 35 with a round chambered. "Checkpoint and checked baggage screening acts as a deterrent to keep those with ill will from attempting to cause catastrophic damage to an aircraft," the TSA said. "Our officers also regularly find firearm components, realistic replica firearms, BB and pellet guns, airsoft guns, brass knuckles, ammunition, batons, stun guns, small pocket knives and many other prohibited items too numerous to note." Between Feb. 5-11 the TSA found 104 firearms in carry-on bags at U.S. airports, exceeding the previous weekly record of 96 from July 2017.